Modood, T. (2018) ‘The Continuing Relevance of a Concept of Multiculturalism’ in Bertelsmann Stiftung (ed) Living Diversity – Shaping Society, Verlag Bertelsmann Stiftung, Germany. Modood, T. (2018) ‘Equality for Secular Belief and Minority Faiths? Reflections on the Commission on Religion in British Public Life’ in J. Walters and E. Kersley (eds) Religion and the Public Sphere: New Conversations, London: Routledge. Modood, T. (2018) ‘Afterword: Multiculturalism Can Foster a New Kind of of Post-Brexit Englishness’ in P. Morey, A. Soliman and A. Yaqin (eds) Muslims, Trust and Multiculturalism: New Directions, London: Palgrave. Meer, N. and Modood, T. (2018) 'The racialisation of Muslims' in (eds) I. Zempi and I. Awan, The Routledge Handbook: Key Readings in Islamophobia, London: Routledge. Modood, T. (2018) ‘Pointing to a Multicultural Future: Rethinking Race, Ethnicity, Religion and Britishness’ in M-C. Foblets and K. Alidadi (eds) Public Commissions on Cultural and Religious Diversity: Vol 2, Internal Dialogues, Critical Compromises and Real-Life Impact, Farnham: Ashgate. Modood, T. (2017) ‘Intercultural Public Intellectual Engagement’ In F. Mansouri (ed), Interculturalism at the Crossroads, Paris: UNESCO; also reproduced as a journal article. Modood, T. (2017) ‘Integration and Multiculturalism in Western Europe’ in International Encyclopaedia of Social and Behavioural Sciences’, in P. Kennett and N. Lendvai (eds) Handbook of European Social Policy, Elgar. Modood, T. (2017) ‘Multicultural Citizenship and New Migrations’, in A. Triandafyllidou (ed), Multicultural Governance in a Mobile World. Edinburgh: Edinburgh University Press. Modood, T. (2016) ‘Multiculturalism and Moderate Secularism’, in J. Shook and P. Zuckerman (eds) Oxford Handbook on Secularism, Oxford University Press. Also published as EUI Working PaperS, RSCAS 2015/47. Download here. Basit, T. and T. Modood (2016) 'Ethnic Capital, Higher Education and Life Chances' in J. Cote and A. Furlong (eds) Oxford Handbook of Higher Education, Oxford University Press. Modood, T. (2016) 'Ethno-religious Assertiveness out of Racial Equality' in D. Llewellyn and S. Sharma (eds) Religion, Equalities, and Inequalities, Ashgate. Meer, N. and Modood, T. (2016) 'The Multicultural State We're In: Muslims, "Multiculture" and the "Civic Re-balancing" of British Multiculturalism', Political Studies 57(3) (2009) reproduced in T. Abbas (ed) Muslim Diasporas in the West, Routledge. Modood, T. (2016) 'Muslims and the Politics of Difference', The Political Quarterly 74(1) (2004) reproduced in T. Abbas (ed) Muslim Diasporas in the West, Routledge. Meer, N. and Modood, T. (2016) 'Muslim-State Relations in Great Britain: An Evolving Story', in R. Mason (ed) Muslim Minority - State Relations, Palgrave. Meer, N., Modood, T. & Zapata-Barrero, R. (2016) ‘A Plural Century: Situating Interculturalism and Multiculturalism’ in N. Meer, T. Modood and R. Zapata-Barrero (eds) Multiculturalism and Interculturalism: debating the dividing lines, Edinburgh University Press. ​Modood, T. (2016) ‘Interculturalisms. Multiculturalism and the Majority’ in N. Meer, T. Modood and R. Zapata-Barrero (eds) Multiculturalism and Interculturalism: debating the dividing lines, Edinburgh University Press. Modood, T. (2016) ‘State-Religion Connections and Multicultural Citizenship’ in J. L. Cohen and C. Laborde (eds) Religion, Secularism, and Constitutional Democracy, Columbia University Press. Modood, T. (2015) ‘’The Mythical Death of Multiculturalism’, in D. Acosta Arcarazo and A. Wiesbrock (eds) Global Migration: Old Assumptions, New Dynamics, Praeger, pp. 197-218. Modood, T. (2015) ‘Multiculturalism and integration’, in ‘National Minorities and the Crisis of Multiculturalism in Europe’, Response to an Interview with the Former OSCE High Commissioner on National Minorities Knut Vollebaek, in Andreea Udrea (ed.) European Yearbook of Minority Issues Online, 12(1): 33-55. Meer, N., Uberoi, V. and Modood, T. (2015) ‘Nationhood and Muslims in Britain’ in N. Foner and P. Simon (eds) Fear, Anxiety, and National Identity: Immigration and Belonging in North America and Western Europe, Russell Sage Foundation e-book. Download here. Modood, T. (2015) 'Integration and Multiculturalism: Focus on Western Europe', in J. Wright (ed.) International Encyclopedia of the Social & Behavioral Sciences, 2nd ed., Vol 12, Elsevier, pp. 235-242. Modood, T. (2015) ‘Rethinking Multiculturalism, Interculturalisms and the Majority’, in V. Uberoi and T. Modood (eds.) Multiculturalism Rethought: Interpretations, Dilemmas and New Directions, Edinburgh University Press, 2015. Modood, T. (2014) ‘Is There a Crisis of ‘Postsecularism’ in Western Europe’, in R. Braidotti, B. Blaagaard, T. de Graauw and E. Midden (eds) Transformations of Religion and the Public Sphere: Postsecular Politics, Palgrave. Modood, T. (2014) ‘Befindet sich der Sakularismus in Westeruopa in der Krise?’ in R. Polak and R. Wolfram (eds) Religion im Wandel, Vienna: Vienna University Press, pp. 21-48. Modood, T. (2014) ‘Multiculturalism and Britishness: Provocations, Hostilities and Advances’ in R. Garbaye and P. Schnapper (eds) The Politics of Ethnic Diversity in the British Isles, Palgrave. Modood, T. (2014) ‘Multiculturalism and Integration’, in R. Race and V. Lander (eds), Advancing Race and Ethnicity in Education, pp. 145-161, Basingstoke and New York: Palgrave. ​Meer, N. & Modood, T. (2013) 'Interacting interculturalism with multiculturalism: observations on theory and practice', in M. Barrett (ed.) Interculturalism and multiculturalism: similarities and differences, Council of Europe. ​Modood, T. (2013) ‘Afterword: Islamophobia and the struggle for recognition’, in Meer, N. (ed.) Racialization and Religion: Race, Culture and Difference in the Study of Anti-Semitism and Islamophobia, Routledge. Modood, T. (2013) ‘Multiculturalisme civique et identite nationale’ in Guerard de Latour, S. (ed.) Le Multiculturalisme a-t-il un avenir?, Paris: Hermann. ​Modood, T. (2013) ‘Four Modes of Integration’ in M-C. Foblets and J-P. Schreiber (eds) Les Assises De L’Interculturalite, Larcier. ​Modood, T. (2013) ‘Muslims, religious equality and secularism’ in A. Berg-Sorensen (ed.) Contesting Secularism: Comparative Perspectives, Ashgate. Modood, T. & Meer, N. (2013) 'Multiculturalism', in The Oxford Companion to Comparative Politics. Oxford University Press. Modood, T. (2013) ‘Censor or Censure: Maintaining Civility’ in R. Griffith-Jones (ed) Islam and English Law: Rights, Responsibilities and the Place of Shari’a’, Cambridge University Press. Modood, T. & Dobbernack, J. (2013) ‘Accepting Multiple Differences: The Challenge of Double Accommodation’, in J. Dobbernack & T. Modood (eds) Tolerance, Intolerance and Respect: Hard to Accept?, Palgrave. Dobbernack, J. & Modood, T. (2013) ‘The Acceptance of Cultural Diversity in Europe: Theoretical Perspectives and Contemporary Developments’, in J. Dobbernack & T. Modood (eds) Tolerance, Intolerance and Respect: Hard to Accept? , Palgrave. Dobbernack, J. & Modood, T. (2013) ‘Conclusion’, in J. Dobbernack & T. Modood (eds) Tolerance, Intolerance and Respect: Hard to Accept? Palgrave. Meer, N. & Modood, T. (2013) 'Contemporary developments in European citizenship regimes', in D. Kiwan (ed.) Naturalization Policies, Education and Citizenship: Multicultural and Multi-nation Societies in International Perspective. Palgrave. Modood, T. & Meer, N. (2013) ‘Framing Contemporary Citizenship and Diversity in Europe’, in R. Taras (ed.) Challenging Multiculturalism: Managing Diversity in Europe. Edinburgh University Press. Meer, N. & Modood, T. (2013) ‘The “civic re-balancing of British Multiculturalism”, and beyond...’, in R. Taras (ed.) Challenging Multiculturalism: Managing Diversity in Europe, Edinburgh University Press. Modood, T. (2013) ‘Post-Immigration "Difference" and "Integration", in P. Taylor-Gooby (ed.) New Paradigms in Public Policy, Oxford University Press. Modood, T. (2012) ‘Capitals, Ethnicity and Higher Education’ in T. Basit & S. Tomlinson (eds) Social Inclusion and Higher Education, Policy Press. Almanya ve Göç, 50. Yılında Almanya’da Türkler Sempozyumu, Ankara: Government of Turkey. Modood, T. & Meer, N. (2011) ‘Framing Contemporary Citizenship and Diversity in Europe’, in A. Triandafyllidou, T. Modood & N. Meer (eds) European Multiculturalisms: Cultural, Religious and Ethnic Challenges, Edinburgh University Press, 33- 60. Triandaffyllidou, A., Modood, T. & Meer, N. (2011) ‘Introduction: Diversity, Integration, Secularism and Multiculturalism’, in A. Triandafyllidou, T. Modood & N. Meer (eds) European Multiculturalisms: Cultural, Religious and Ethnic Challenges, Edinburgh University Press, 1-29. Modood, T. (2011) ‘Multiculturalism, Ethnicity and Integration: struggling with confusions’, in H. Mahamdallie (ed.) Defending Multiculturalism: A Guide for the Movement, Bookmarks. Modood, T. & Salt, J. (2011) ‘Migration, Minorities and the Nation’ in T. Modood & J. Salt (eds), Global Migration, Ethnicity and Britishness, Palgrave, 3-13. Ethnicity and Britishness, Palgrave, 40-62. Modood, T. (2011) ‘Multiculturalism, Ethnicity and Integration: Some Contemporary Challenges’ in T. Modood & J. Salt (eds), Global Migration, Ethnicity and Britishness, Palgrave, 40-62. Fenton, S., Modood, T. & Smetherham, C. (2011) ‘Academics and Globalisation’ in T. Modood & J. Salt (eds), Global Migration, Ethnicity and Britishness, Palgrave, 108-131. Khattab, N., Sirkeci, I., Johnston, R. & Modood, T. (2011) ‘Ethnicity, Religion, Residential Segregation and Life Chances’ in T. Modood & J. Salt (eds), Global Migration, Ethnicity and Britishness, Palgrave, 153-176. Dwyer, C., Modood, T., Sanghera, G., Shah, B. & Thapar-Bjorkert, S. (2011) ‘Educational Achievement and Career Aspirations of Young British Pakistanis’ in T. Modood & J. Salt (eds), Global Migration, Ethnicity and Britishness, Palgrave, 177-204. Uberoi, V., Modood, T., Meer, N. & Dwyer, C. (2011) ‘Feeling and Being Muslim and British’ in T Modood & J. Salt (eds), Global Migration, Ethnicity and Britishness, Palgrave, pp. 205-224. Modood, T. & Salt, J. (2011) ‘Global Migration, Ethnicity and Britishness’ in T. Modood & J. Salt (eds), Global Migration, Ethnicity and Britishness, Palgrave, pp. 248-268. Modood, T. (2011) ‘Multicultural British Citizenship and Making Space for Muslims’ in C. Flood & S. Hutchings (eds) Islam in its International Context, Cambridge Scholars Press. Modood, T. (2011) ‘Capitals, Ethnic Identity and Educational Qualifications’, in R. Alba & M. Waters (eds) The Next Generation: Immigrant Youth in a Comparative Perspective, New York University Press, pp. 185-206. Modood, T. & Meer, N. (2010) ‘Britain’ in A. Triandafyllidou (ed.) Muslims in Twenty First Century Europe: Structural and Cultural Perspectives, Routledge. Meer, N. & Modood, T. (2010) ‘Diversity, Identity, and Multiculturalism in the Media: The Case of Muslims in the British Press’, in G. Cheney, S. May & D. Munshi (eds), Handbook of Communication Ethics, Routledge. Modood, T. (2010) ‘Multiculturalism in the West and Muslim Identity’, in M. Merry & J. Milligan (eds) Citizenship, Identity and Education in Muslim Communities, Palgrave, 63-83. Modood, T. (2010) ‘Multicultural Citizenship and the Shari’a Controversy in Britain’ in R. Adhar & N. Aroney (eds) Shari’a in the West, Oxford University Press. Meer, N. & Modood, T. (2010) 'The Racialization of Muslims' in S. Sayyid & A.K. Vakil (eds) Thinking Through Islamophobia: Global Perspectives, Columbia University Press. Modood, T. (2010) ‘Secularism and Democracy: Some Responses to Ted Cantle and Sunder Katawala’, in Y. Birt, D. Hussain & A. Siddiqui (eds) British Secularism and the State: Islam, Society and the State, Kube Publishing, 98-104. Modood, T. (2010) ‘Civic Recognition and Respect for Religion in Britain’s Moderate Secularism’, in Y. Birt, D. Hussain & A. Siddiqui (eds) British Secularism and the State: Islam, Society and the State, Kube Publishing, 55-76. Modood, T. (2010) ‘Multiculturalism and Citizenship’, in K. Knott & S. McLoughlin (eds) Diasporas, Zed Books, 50-54. Meer, N. & Modood, T. (2010) ‘Refutations of Racism in the ‘Muslim Question’, in M. Malik (ed.) Anti-Muslim Prejudice: Past and Present, Routledge. Modood, T. (2010) ‘Muslims in Britain and the Struggle for Ethno-Religious Equality’ in M. Higgins, C. Smith & J. Storey (eds) Cambridge Companion to Modern British Culture, Cambridge University Press, 296-310. Modood, T. (2010) ‘Multiculturalism, Citizenship and National Identity’ in C. Hay (ed.) New Directions in Political Science, Palgrave, 109-129. Modood, T. (2010) ‘Multicuturalismo, etnicidade e integracao: desafios contemporaneos’, in G. Axt & F. Luis Schuler (eds) Fronteiras do Penamento, Civilizacao Brasileira. Modood, T. (2010) ‘Multiculturalism, Liberal Citizenship and National Identity: On British Muslims’, in M. Guibernau & J. Rex (eds) The Ethnicity Reader: Nationalism, Multiculturalism and Migration, Polity, 243-250. Modood, T. (2010) ‘Difference, "Multi", and Equality’ in M. Seymour (ed.) The Plural States of Recognition, Palgrave. Modood, T. (2009) 'In defence of Multicultural Citizenship' in J Pugh (ed.) What Is Radical Politics Today? Palgrave. Modood, T. (2009) ‘Migration, Ethno-Religious Groups and Integration’, in C. Timmerman, J. Leman, H. Roos & B. Segaert (eds) In-Between Spaces: Christian and Muslim Minorities in Transition in Europe and the Middle East, Peter Lang. Modood, T. (2009) ‘Difference, multiculturalisme et egalite’, in M. Seymour (ed.) ‘La Reconnaissance dans tous ses etats’, Quebec Amerique. Modood, T. (2009) 'Ethnicity and Religion', in Flinders, M., A. Gamble, C. Hay & M. Kenny (eds), The Oxford Handbook of British Politics, Oxford University Press. Meer, N., Sala Pala, V., Modood, T. & Simon, P. (2009) ‘Cultural Diversity, Muslims, and Education in France and England: Two Contrasting Models in Western Europe’ in J. A. Banks (ed) The Routledge International Companion to Multicultural Education, Routledge. Enneli, P. & Modood, T. (2009) ‘Young Turkish-speaking People in the UK: Early Employment Experiences and Dependency on Ethnic Enclave', in T. Kucukcan & V. Gungor (eds) Turks in Europe: Culture, Identity, Integration, Turkevi Research Centre. Modood, T. (2009) ‘The State and Ethno-Religious Mobilisation in Britain’, in J. Hochschild & J. Mollenkopf (eds) Bringing Outsiders In, Cornell University Press. Modood, T. (2009) ‘Muslims, Religious Equality and Secularism’, in M. Dimova-Cookson (ed.) Multiculturalism and Moral Conflict, Routledge. Modood, T. (2009) ‘Muslims and the Politics of Difference’, in P. Hopkins & R. Gale (eds), Muslims in Britain: Race, Place and Identities, Edinburgh University Press. Levey, G. & Modood, T. (2009) ‘Liberal Democracy, Multicultural Citizenship, and the Danish Cartoon Affair’ in G. B. Levey & T. Modood (eds) Secularism, Religion and Multicultural Citizenship, Cambridge University Press. Modood, T. (2009) ‘Muslims, Religious Equality and Secularism’, in G. B. Levey & T. Modood (eds) Secularism, Religion and Multicultural Citizenship, Cambridge University Press. Modood, T. (2008) ‘Multiculturalism, Citizenship and National Identity’, in B. Turner, E. Isin & P. Nyers (eds) Citizenship Between Past and Future, Routledge. Modood, T. (2008) ‘O dilema liberal: integracao ou vilificacao?’ in FMP (Fundacao Escola Superior Do Ministerio Publico) Revista Da Faculdade De Direito Da FM, FMP, No 02. Modood, T. (2008) ‘Remaking Multiculturalism, post 7/7’, in J. Eade et al. (eds) Advancing Multiculturalism, Post 7/7, Cambridge Scholars Publishing. Modood, T. (2008) ‘South Asian Assertiveness in Britain’, in S. Koshy & R. Radhakrishnan (eds), Transnational South Asians: The Making of a Neo-Diaspora, Oxford University Press. Modood, T. (2008) ‘Muslims, Equality and Secularism’ in B. Spalek and A. Imtoual (eds) Religion, Spirituality and the Social Sciences, Policy Press. Modood, T. (2008) ‘Muslim Integration and Secularism’ in M.-C. Foblets (ed.) Islam & Europe: Challenges and Opportunities, Leuven University Press, 85-112. Modood, T. (2008) ‘A Defence of Multiculturalism’, in S. Davidson & J. Rutherford (eds) Race, Identity and Belonging, Lawrence and Wishart. Modood, T. & Kastoryano, R. (2007) 'Secularism and the Accommodation of Muslim Identities', in G. Raymond & T. Modood (eds) The Construction of Minority Identities in France and Britain, Palgrave McMillan. Modood, T. (2007) ‘Britishness Out of Immigration and Anti-Racism’, in B. Chandra & S. Mahajan (eds) Composite Culture in a Multicultural Society, Longman, 32–49. Modood, T. & May, S. (2006) '"Inglitere" de cokkulturluluk ve egitim: Dahili bit tartisma', in R. Kaymakcan (ed. ), Çokkültürlülük Eğitim, Kültür ve Din Eğitimi, 97-115. Modood, T. (2006) ‘Muslims and European Multiculturalism: Developments in Britain’, in R. Lewis (ed.) Multiculturalism Observed: Exploring Identity, VUB Press, 107–133. Modood, T. (2006) ‘Muslims and European Multiculturalism’, in K. Michalski (ed.) Religion in the New Europe, Central European University Press, 97-111. Modood, T. (2006) 'Politics of Blackness and Asian Identity', in N. Ali, V.S. Kalra & S. Sayyid (eds), A Postcolonial People: South Asians in Britain, Hurst, 64-71. 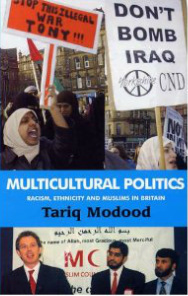 Modood, T. (2006) ‘British Muslims and the Politics of Multiculturalism’, in T. Modood, A. Triandafyllidou & R. Zapata-Barrero (eds), Multiculturalism, Muslims and Citizenship: A European Approach, Routledge. 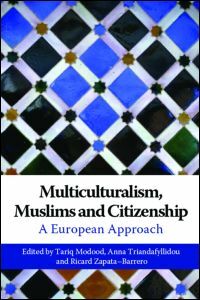 Modood, T. & Kastoryano, R. (2006) 'Secularism and the Accommodation of Muslims in Europe', in T. Modood, A. Triandafyllidou & R. Zapata-Barrero (eds), Multiculturalism, Muslims and Citizenship: A European Approach, Routledge. 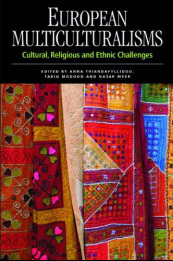 Triandafyllidou, A., Modood, T. & Zapata-Barrero, R. (2006) ‘European Challenges to Multicultural Citizenship’, in T. Modood, A. Triandafyllidou & R. Zapata-Barrero (eds), Multiculturalism, Muslims and Citizenship: A European Approach, Routledge. Ahmad, F., Lissenburgh, S. & Modood, T. (2005) ‘South Asian Women and Employment in Britain: Diversity and Social Change’, in E. Spaan, F. Hillmann & T van Naerssen (eds) Asian Migrants and European Labour Markets, Routledge. Modood, T. (2005) ‘Ethnicity and Intergenerational Identities and Adaptations in Britain: The Socio-Political Context’, in M. Rutter & M. Tienda, Ethnicity and Causal Mechanisms, Cambridge University Press. Modood, T. (2005) 'Ethnicity and Political Mobilisation in Britain', in G. Loury, T. Modood & S. Teles (eds) Ethnicity, Social Mobility and Public Policy in the US and UK, Cambridge University Press, 457-474. Loury, G., Modood, T. & Teles, S. (2005) 'Introduction', in G. Loury, T. Modood & S. Teles (eds), Ethnicity, Social Mobility and Public Policy in the US and UK, Cambridge University Press, 1-17. Modood, T. (2005) 'The Educational Attainments of Ethnic Minorities in Britain', in G. Loury, T. Modood & S. Teles (eds), Ethnicity, Social Mobility and Public Policy in the US and UK, Cambridge University Press, 288-308. Modood, T. (2005) ‘Social and Cultural Capitals, Ethnic Identity and Educational Qualifications’, in D. Hoerder, Y. Hebért & I. Schmitt (eds), Negotiating Transcultural Lives: Belongings and Social Capital Among Youths in Comparative Perspective’, V&R UniPress. Modood, T. (2004) ‘Foreword’, in T. Abbas (ed.) Muslim Britain: Communities Under Pressure, Zed Books. Modood, T. (2004) ‘Musulamanes y multiculturalismo en Europa’, in M.Castells & N. Serra (eds) Europa En Consturccion: Integracion, Edentidades Y Seguridad, CIDOB. May, S. Modood, T. & Squires, J. (2004) ‘Ethnicity, Nationalism and Minority Rights: Charting the Disciplinary Debates’, in S. May, T. Modood & J. Squires (eds) Ethnicity, Nationalism and Minority Rights, Cambridge University Press. 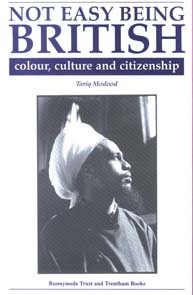 Modood, T. (2004) ‘Multiculturalism, Muslims and the British State’, in S. Sutcliff (ed.) Religion: Empirical Studies, Ashgate, 245-258. Modood, T. (2004) ‘Britishness Out of Immigration and Anti-Racism’, in R. Phillps & H. Brocklehurst (eds) History, Nationhood and the Question of Britain, Palgrave. Modood, T. (2003) ‘The Place of Muslims in British Secular Multiculturalism’, in N. Ghanea-Hercock (ed.) The Challenge of Religious Discrimination At the Dawn of the New Millennium, Brill. Modood, T. (2003) ‘Anti-essenzialismo, multiculturalismo e “riconoscimento” dei gruppi religiosi’, in E. Caniglia & A. Spreafico (eds) Multiculturalismo o Comunitarismo?, Luiss University Press. Modood, T. (2003) ‘New Forms of Britishness: Post-Immigration Ethnicity and Hybridity in Britain’, in R. Sackmann, B. Peters & T. Faist (eds), Identity and Integration. Migrants in Western Europe, Ashgate. Modood, T. (2003) ‘Muslims and the Politics of Difference’, in S. Spencer (ed. ), The Politics of Migration, Oxford. Modood, T. (2003) ‘Ethnic Differentials in Educational Performance’, in D. Mason (ed) Explaining Ethnic Differences: Changing patterns of disadvantage in Britain, Policy Press. Modood, T. (2003) `Multiculturalism, Secularism and the State', in C. Harzig & D. Juteau (eds), The Social Construction of Diversity: Recasting the Master Narrative of Industrial Nations, Berghahn Books. Modood, T. & Favell, A. (2003) ‘The Philosophy of Multiculturalism: The Theory and Practice of Normative Political Theory’, in A. Finlayson (ed.) Contemporary Political Thought: A Reader and Guide, Edinburgh University Press. Modood, T. (2002) ‘Muslims and the Politics of Multiculturalism in Britain’, in E. Hershberg & K. Moore, Critical Views of September 11: Analyses from Around the World, New Press. Modood, T. (2002) ‘The Place of Muslims in British Secular Multiculturalism’, in N. Alsayyad & M. Castells (eds) Muslim Europe or Euro-Islam: Politics, Culture and Citizenship in the Age of Globalisation, Lexington Books. Modood, T. (2001) `Something Old, Something Borrowed, Something New: British Asian Identities' in D. Morley & K. Robins (eds) British Cultural Studies, Oxford University Press. Modood, T. (2000) ‘Race and Ethnicity’ in K. Grint (ed.) Work and Society: A Reader, Polity. Modood, T. (1999) '"Difference", Cultural Racism and Anti-Racism’ in M. Boxill (ed.) Racism: A Reader, Oxford University Press. Modood, T. (1999) ‘New Forms of Britishness: Post-Immigration Ethnicity and Hybridity in Britain’, in R. Lentin (ed.) The Expanding Nation: Towards A Multi-Ethnic Ireland, Trinity College Dublin. Modood, T. (1999) `The Rise and Fall of an Anti-Racism: From Political Blackness to Ethnic Pluralism’, in G. Andrews & A. Hooper (eds) The Long 1960s: New Left, New Right and Beyond, Macmillan. Modood, T. (1998) ‘Ethnic Minorities’ Drive for Qualifications’ in T. Modood & T. Acland (eds), Race and Higher Education, PSI. 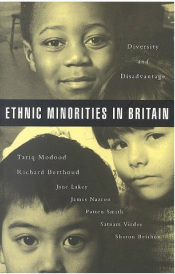 Modood, T. & Berthoud, R. (1998) ‘Ethnic Diversity and Disadvantage in Britain’ in I. Marsh (ed.) Classic and Contemporary Readings in Sociology, Prentice Hall. Modood, T. (1998) `Postmodern Racial Identities’ in W. Kidd et al. (eds) Readings in Sociology, Heinemann. Modood, T., Beishon, S. & Virdee, S. (1998) `Changing Ethnic Identities’ in A. Giddens (ed.) Sociology: Basic Readings, Polity Press. Modood, T. (1998) `Racial Equality: Colour, Culture and Justice’ in D. Boucher & P. Kelly (ed.) Social Justice: From Hume to Walzer, Routledge. Reproduction of Commission on Social Justice, Issue Paper No 5. Modood, T. (1998) `Racial Equality: Colour, Culture and Justice’ in J. Franklin (ed.) Social Policy and Social Justice: The IPPR Reader, Polity Press. Modood, T. (1998) `Atlantic Rift’, in Mindfield: The Race Issue, Camden Press. Modood, T., Metcalf, H. & Virdee, S. (1998) `British Asian Entrepreneurs: Culture and Opportunity Structures' in P. Taylor-Gooby (ed.) Choice and Public Policy, Macmillan. Modood, T. (1998) `Ethnic Diversity and Racial Disadvantage in Employment' in T. Blackstone, B. Parekh & P. Sanders (eds) Race Relations in Britain, Routledge. Modood, T. & Werbner, P. (1997) `Introduction: The Politics of Multiculturalism in the New Europe' in T. Modood & P.Werbner (eds) The Politics of Multiculturalism in the New Europe, Zed Book. Modood, T. (1997) `"Difference", Cultural-Racism and Anti-Racism' in P. Werbner & T. Modood (eds), Debating Cultural Hybridity: Identities and the Politics of Anti-Racism, Zed Books. Modood, T. (1996) ‘If Races Do Not Exist, Then What Does? Racial Categorisation and Ethnic Realities', in R. Barot (ed. ), The Racism Problematic: Contemporary Sociological Debates on Race and Ethnicity, Edwin Mullen Press. Modood, T. (1996) `"Race" in Britain and the Politics of Difference' in D. Archard (ed.) Philosophy and Pluralism, Cambridge University Press. Modood, T. (1995) ‘Collingwood and the Idea of Philosophy' in D. Boucher, J. Connelly & T. Modood (eds), Philosophy, History and Civilisation, Essays on R G Collingwood, University of Wales Press. Modood, T. (1995) ‘The Limits of America: Rethinking Equality in the Changing Context of British Race Relations' in B. Ward & T. Badger (eds) Martin Luther King and the Making of the Civil Rights Movement, Macmillan. Modood, T. (1994) ‘The End of a Hegemony: The Concept of "Black" and British Asians', in B. Drury & J. Rex (eds), Ethnic Mobilisation in a Multi-Cultural Europe, Gower. Modood, T. (1994) `Ethnic Difference and Racial Equality: New Challenges for the Left', in D. Milliband (ed.) Reinventing the Left, Polity Press. Modood, T. (1993) ‘Muslims, Incitement to Hatred and the Law' in J. Horton (ed.) Liberalism, Multiculturalism and Toleration, Macmillan. Modood, T. (2002) ‘Sull' essere di origine non europea in Gran Bretagna: etnicità e la basi della integrazione nazionale', in L. Tomasi (ed.) I Giovani Non Europei Ed II Processo d'Integrazione, Reverdito. Modood, T. (1992) ‘On Not Being White in Britain: Discrimination, Diversity and Commonality', in M. Leicester & M. Taylor (eds) Ethics, Ethnicity and Education, Kogan Page. Modood, T. (1992) ‘Cultural Diversity and Racial Discrimination in Employment' in B. Hepple & E. Szyszczak (eds) Discrimination: The Limits of Law?, Mansell.